Artist's illustration of NASA's Orion crew capsule in space. The biggest threats to safety at NASA might be low budgets and a relative lack of accountability, according to a new report. This and other findings come from the 2015 annual report by the Aerospace Safety Advisory Panel (ASAP), which reports to NASA and Congress. The 42-page report returns several times to the theme of adequate funding and time for testing new space vehicles. For example, it notes that NASA's Commercial Crew Program (CCP) — which is encouraging the development of private spacecraft to fly agency astronauts to and from orbit — doesn't even have a budget yet for 2016, making it harder to manage the program. "Historically, most successful programs have reflected a bias towards robust, early funding to support critical design and system decisions," the report states. "NASA's budget is insufficient to deliver all current undertakings with acceptable programmatic risk." Accountability is another major issue. The ASAP report states that, in some cases, it's not clear who is responsible for what, and this uncertainty contributes to an increase in risk. For example, there needs to be a clear and transparent rationale for a given risk taken, as well as a good understanding of the benefits that should accrue, the report says. A discussion of alternative strategies is also necessary, as is the identification of a single person with the relevant responsibility, the report's authors wrote. Retired Vice Adm. Joseph W. Dyer, chairman of the ASAP, noted that there's a clear difference between accountability for running a mission and accountability for initiating a new program such as a vehicle design. "NASA is a wonderful benchmark for risk acceptance and accountability on the operational side," he told Space.com. "The readiness reviews are very well done, and there's a paper trail of what was decided, when, where, why, by whom. It's much less structured on the new-program side. It works well, and has good people, but it's a bit personality-based rather than process-based. Committees are braver than individuals." Continuity is a related problem. The report notes that each change in presidential administration causes a lot of uncertainty, making it difficult to maintain programs that will last more than four years at a time. That can put pressure on the agency to maintain schedules. One place this issue manifests, according to the ASAP report, is in NASA's Exploration Missions, which will test the launch systems for the agency's Orion crew vehicle that is designed to help get astronauts to deep-space destinations such as Mars. The first crewed flight of Orion atop the in-development Space Launch System (SLS) megarocket is scheduled to take place in 2021. The pressure to maintain that launch date, combined with the numerous changes to the Orion vehicle testing regimen — in no small part a result of the cancellation of NASA's moon-oriented Constellation program in 2010 — could make flights riskier, the report's authors wrote. 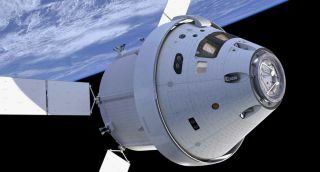 The Orion vehicle hasn't had, and likely won't have, end-to-end flight-safety tests ahead of a trip to lunar space, the report's authors wrote. That could be a problem if something goes wrong once Orion leaves low Earth orbit, because it can take as long as 11 days to get back to Earth from the vicinity of the moon, the report states. Dyer noted that much of the self-imposed pressure comes from mission architects' unwillingness to "start over" — under previous administrations, there were a number of times when mission parameters or goals were changed midstream, and that had an effect on the psychology of workers at NASA, making them more interested in getting something flying on schedule. The panel's recommendations for 2015 include performing risk assessments for Orion and redefining procedures in response to potential mishaps on crewed flights. Currently, presidential commissions investigate incidents in which the vehicle is lost, even if the crew is safe. This strategy makes sense for the space shuttle or other government-owned systems, since those are "national assets," according to the ASAP report. However, it makes less sense for a privately owned commercial crew vehicle, such as SpaceX's Dragon capsule or Boeing's CST-100 Starliner capsule, the report's authors said. But the ASAP report was not all doom and gloom. The International Space Station (ISS), the report says, "continues to demonstrate exemplary performance despite three cargo-bearing launch mishaps within one year," the report said. NASA and its partners in the ISS program responded to these cargo losses —Orbital ATK's Cygnus spacecraft, Russia's Progress freighter and SpaceX's Dragon resupply capsule — impressively, the panel wrote. The NASA Engineering and Safety Center also won praise. The report also says that, whatever its issues, NASA's human spaceflight program — which is based on Orion, the SLS and the associated Ground Systems Development and Operations — is progressing well. In a statement, NASA officials said, "NASA's commitment to safety remains the agency's first priority. As we begin a new chapter in exploration, in which American commercial companies provide goods and services for ongoing low Earth orbit activities, we recognize we will encounter new challenges for ensuring the safety of our astronauts."